This Easter Weekend, many people took off in different directions to enjoy their scant summer holidays. 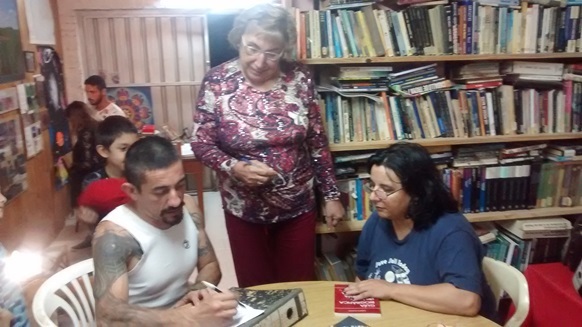 Victoria, in the province of Entre Rios, was no exception, nor was the Museum [Museo del Ovni] which was visited by hundreds of people interested in the subject, some skeptics and others having had experiences with the subject. One of them was Charly, as we shall call him. It's a lovely thing to see a person retell an experience in a fully natural way, without any prejudice. This is a good sign for us as a team, since we believe we provide an atmosphere of sufficient confidence for [witnesses] to do so, and it's another positive sign for UFO research in Argentina, since the oddballs today are the ones who mock people like us, who dare discuss our experiences. I would even go further and say that we do so without making value judgements on what we're narrating. Charly came to the Museum with great joy, accompanied by relatives and friends, with the firm purpose of seeing everything related to the subject. When he stopped watching the video, we started telling him the details of the exhibits in the museum. While we went over the Cota Colman case, Charly made a stunning statement: "I saw a creature in Venado Tuerto." I finished telling the Cota Colman story since there were other visitors to the Museum, and then I proceeded to take down Charly's experiences in full detail. 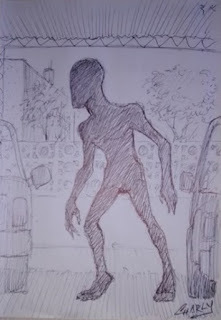 Twenty-two years ago (1994) the witness was traveling in a motorcycle with his ex-wife, when they drove into a parking area in the city and both saw a figure standing approximately 1.90 meters tall, darkened by the shadows and in contrast with the white wall behind them. This fact allowed them to see the figure's outline properly, but were unable to make out its features. There were four cars before them with a wall in back. It was very dark in the recesses. The figure was between two of the [vehicles] and some 12-15 meters from the witnesses. The woman panic, shouting: "Look! look!" and holding Charly tightly. Fear made him hit the accelerator and return home, a block away from the scene of the encounter. The witness says the creature was similar to the one appearing in the movie "Signs", mentioning that there is a scene in the movie showing a case occurring in Brazil during a birthday party. Moreover, the parking lot creature made a swinging movement similar to the one in the movie, when the alien takes the protagonist's child in its arms. Argentina: "The South is Being Visited by UFOs"